Heather Lang is the online managing editor for The Literary Review, co-editor of Petite Hound Press, and an adjunct professor. She is a graduate of Fairleigh Dickinson University’s low-residency MFA in Creative Writing program, and her chapbook manuscript, Common Prayers, was named a semifinalist in the 2014 Tupelo Press Snowbound Chapbook Award competition. Her poetry has been nominated for a Pushcart Prize and has been published by or is forthcoming in december, Jelly Bucket, Mead, Watershed Review, and others, and she has reviewed for Atticus Review and HTMLGIANT, among others. to be one time zone closer to you. aisles splashed in some sort of white light. Kleenex box. I am today’s postmodern desert outlaw. wondering what’s set to repeat. 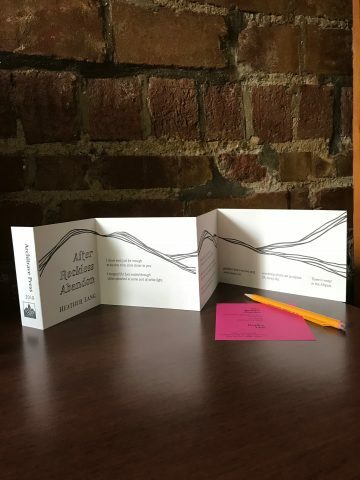 Poem letterpress printed by hand on 100lb archival card stock measuring 22.5″ x 4.5″ with 4 folds & packaged in an individual sleeve. Numbered edition of 50 copies.